Head on over to FreebieBuzz's Printable Coupon Page to print yourself a Buy One Get One FREE Celsius Energy Drink Coupon! Sounds like a great coupon to me! They have a store locator so you can find locations that sell this product. 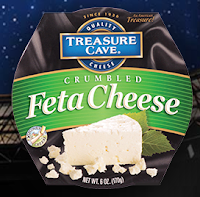 Treasure Cave is currently hosting a Treasure Cave Cheese Bowl Sweepstakes now through February 5th! You have a chance of winning 1 of 100 FREE Treasure Cave Football Helmet Dip Bowls, which is a $45 value! In addition, a lucky grand prize winner will win a FREE trip for two. You can enter daily. Good luck everyone! Head on over to Cinnabon's Facebook Page and sign up for their newsletter to snag a coupon valid for a FREE Minibon Roll! You can always unsubscribe to their newsletter at any time. Here is the Cinnabon store locator in case you need help finding a close location! Now through January 2nd, you can score 50% Off Your Entire Order at Papa John's when you use coupon code NYRES at checkout and use Visa Checkout when paying. You can use any credit card while paying, not just Visa. This is perfect for New Year's Eve! If you're a chocolate fan and looking to save some cash, here's a new printable coupon for you! You can score a new coupon valid for $1.50 Off Two M&M's 8oz or larger! If there's any sales to pair this coupon with, I'll let you guys know! What's a better way to welcome the new year than with some delicious ice cream? 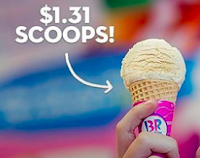 Today only, you can head to Baskin Robbins to score $1.31 Ice Cream Scoops! This is valid for every size. The Baskin Robbins Facebook Page has more information on this offer.